A Left parties-civil society organizations delegation led by CPI-M politbureau member Hannan Mollah, general secretary of the All-India Kisan Sabha, has told President Pranab Kumar Mukherjee that there is a “brazen attempt” on the part of the Government of Madhya Pradesh to “forcibly evict” thousands of Narmada dam oustees from their villages under the pretext of the Supreme Court order dated February 8, 2017. Pointing out that the oustees are sought to be evicted forcibly before July 31, the delegation said, the state government is “ignoring” the Supreme Court order of providing “compensation and complete rehabilitation of the dam-affected villages”. Others who were in the delegation were Annie Raja of the National Federation of Indian Women and Vimal Bhai and Himshi Singh of the National Alliance of People’s Movements. During the meeting, Himshi Singh gave crucial statistics, alleging, “the Madhya Pradesh government is manipulating its own statistics of the Action Taken Report- 2008 which gives a count of 31,180 families affected by the Narmada dam. It has now drastically reduced the number in the recently issued Gazette, 2017 by 18,346”. A memorandum submitted by the delegation said, as per the orders of Supreme Court, the last date for giving compensation and ensuring complete rehabilitation was May 8, 2017, but till now, the state government has not done any survey which could list project affected families entitled to compensation and rehabilitation. The memorandum wondered, how the state government could even think of evicting people without rehabilitation, insisting, this was a clear contempt of spirit of court orders and judgments along with the murder of constitutional rights of project-affected families. 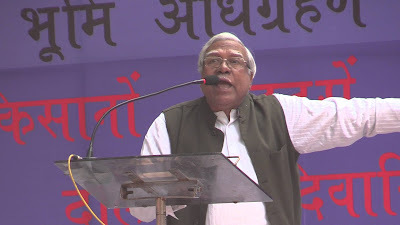 Pointing out that the “forcible eviction” would prove to be a disaster, as families are without alternative land, livelihood and livable rehabilitation sites, Mollah told the President that he visited the Narmada Valley as a fact-finding team, and found that their life and culture was facing the threats of submergence. Vimal Bhai explained the environmental impact in the form of chlorofluorocarbon – an organic compound that contains carbon, chlorine, and fluorine, produced as volatile derivative of methane, ethane, and propane. Pointing out that this is happening “due to the submergence of lakhs of trees”, he also gave details of the condition of rehabilitation sites, which still lacked basic amenities, cracks on houses due to black soil and no drinking water availability.